Yes I know that is not how the songs goes, but I have mentioned on more than one occasion that I see myself as a bit of a rule breaker at times and I guess this is one of those times. Plus I couldn't think of another title and for some reason my crazy little brain likes to have a title before I get much written. It feels like forever since I just sat down and wrote. Just let the words purge forth, freeing themselves from the grasps that somehow created and then held them within my mind. One week home from all that DPCON13 was and I am still reeling from the effects. Thankfully I no longer feel as battered and bruised as what I first did. There is no doubt that the experience has changed me, and that is certainly not a bad thing. It is all just a bit different to my expectations. My sister wisely pointed out to me that she doesn't have expectations, which means she is never disappointed. Words that I can clearly recall hearing my mother say at various times as well. To a certain extent I can see where they are coming from. 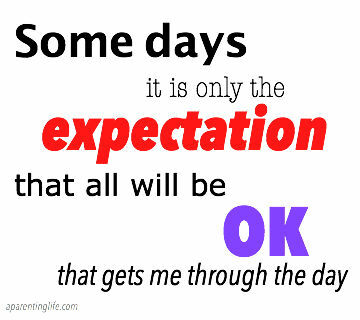 There is however a part of me that thinks if you don't have expectations how can you grow? In my mind expectations are a bit of a double edge sword. For as much as they may lead you to disappointment at times, without them there can be an absence of motivation and dedication. Being the eternal optimist that I am it is a little hard at times not to expect the best, or at least expect more than the worst. As much as my title may suggest that today has not been a good Monday. It has been. The four day weekend was just what the doctor ordered. I actually think he tried to order a few more of them but apparently that is just not to be. Thankfully after this short four day week, we are blessed with a week off from school. Which again is not nearly long enough but I am thinking it is possibly one of those examples where there would never be enough. For now though there is a lovely swimming pool calling my name. As much as I may have ushered Mr Awesome and the kids out of the door to provide me with some quite writing time the stifling heat has me beat and I am off to join them in the cool refreshing water. Make sure you pop back tomorrow, I have a little giveaway you might be interested in. I think it's great that you're an optimist. I'm usually way too negative and it's not a great way to live. Oh yes I couldn't agree more dearest Ness, optimism certainly has a place and negativity kept to a low. I find it really hard to not have any expectations. I think it's great that you are an optimist.